Before Giles had set off on his own holiday, he sent out a couple of text messages to some of friends, briefly telling them who I was, what I was doing in London and why I was staying in his house, and giving them my phone number so that they could get in touch with me and hopefully hang out and show me around. John was the first of the friends to get in touch with me, and we arranged to meet up for brunch one morning at Hackney Village, the small main street of the borough that was lined with a whole bunch of shops and cafes, and was also conveniently located around the corner from where Giles lived. John was incredibly friendly, and we instantly got on well as we talked about everything from travelling the world, to the finer details of life in London – and the extensive geography of the city that I was still trying to wrap my head around – as well as stories of my most recent travels and how I had come to meet Giles in Berlin. John himself had done quite a bit of travelling, though it took a little while before I noticed the hint of South African accent in his voice. “England is home now,” he assured me, but he’d also visited some interesting places that were definitely on my travel wish list, as well as having a few crazy stories his life in Africa. Towards the end of our brunch, John’s phone rang. “Oh, I’m really sorry, I just have to quickly take this.” He answered the phone and spoke for a few minutes before hanging up. “So, I promise there’s a good reason I had to take that call,” John told me. “That was my friend Richard. We’ve got some plans for a late boozy lunch with some other friends of Giles’, so I just confirming a few last things with Richard. But also, you’re more than welcome to join us. We’re going to Richard’s place, which is just down near my place.” John lived south of the River Thames, in Greenwich. “We can go back to Giles’ if you need to grab anything, and then I’ll drive us down there.” I had made no other plans for the day, and a lazy wine lunch sounded like the perfect way to end a Sunday afternoon, so after we finished up with brunch we were off and away to Greenwich. After a quick supply stop at Sainsbury’s, John and I arrived at Richard’s flat. Two more of their friends, a couple named Adam and Dan, arrived shortly afterwards, and I soon found myself in a similar group dynamic that I had when I was Joris and Thijs’ friends in Amsterdam – getting an inside view of the life of the locals – except there wasn’t a mix of languages being thrown around, so I could keep up with all of the conversation. They were all lovely guys, and Richard and John were moving back and forth between the kitchen getting the food ready. ‘Lunch’ was eventually served somewhere between five and six o’clock, but we’d all been drinking so much wine I don’t think that anyone was all that bothered. “We’ll have to make another trip to Spain soon, John,” Richard said as he opened another bottle of red. “I’ve nearly cleaned out the cellar,” he said with a chuckle. They proceeded to tell me about how they make semi-regular pilgrimages to France and Spain, stocking up the boot of John’s car with as much wine as they could physically (and legally) carry back to England, because it was actually better value for money in the long run. I could definitely believe that, and I was insanely jealous. The fact that they could so easily drive to another country like that just absolutely blew my mind. If you drove that distance in pretty much any direction in Australia, chances are you’d probably just end up in the middle of nowhere. Granted, there could quite possibly be a vineyard in that middle of nowhere in Australia, but you didn’t exactly need to stamp your passport to get there. It was such a fun night. A wine lunch became a wine dinner, followed by a wine dessert which eventually just turned into wine with more wine – and a few shots of some sort of spirit, if memory serves me correct (although there’s a high possibility that it doesn’t). The next day, Richard would count the bottles and inform us that we consumed 10 bottles between four people – Adam wasn’t a fan of wine and so had been drinking beer. 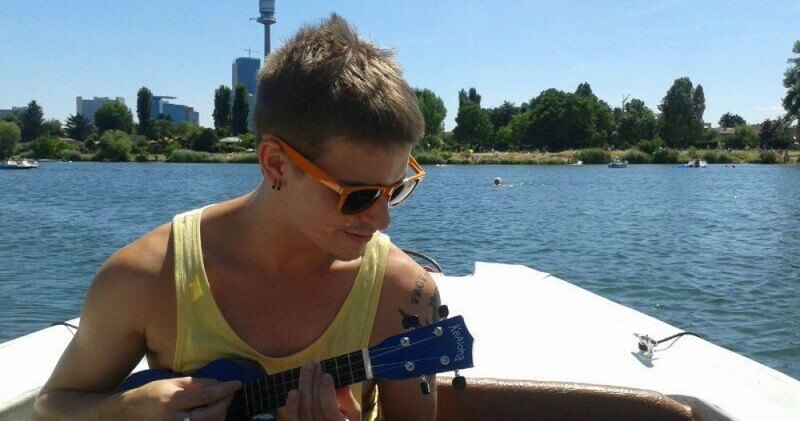 We played music, we danced, we sat on the balcony watching dusk settle over London, and we drank a lot much wine. Despite having been to a handful of pride parties over the last few months, it was quite easily the most I had drank in a very long time. I had absolutely no recollection of the end of the night, which usually never happens to me, but I can only assume I continued to have as much fun as I was having before my memory began to fail on me. Waking up in a strange place is always terrifying. Waking up in a strange place in a foreign country is even worse. I awoke with a start and sat up, looking around and thinking hard for a good minute or two before I realised where I was – I had passed out on Richard’s couch. I guessed that I’d been in no state to catch the tube home the night before, and absolutely nobody had been in any fit state to drive me home. The result was this, and I was greeted by a Richard who looked just as confused and hungover as me. “What… I… what?” Fully formed sentences were a struggle for everyone at that point, and the sight of all those wine bottles in the kitchen was simultaneously horrifying and impressive. “I’m definitely ‘working from home’ today,” Richard said sarcastically, holding his head in his hands. We’d later find out both John and Dan had both made the exact same call, for obviously the exact same reason. I was expecting I’d just have to find my way to the Underground station and catch the tube home, but Richard began asking me what I’d seen so far in London. When I said that I hadn’t really seen much so far, I think he got a little patriotic. “I feel like I should be showing you around or something. I’ve got a car – is there anywhere you want to go?” We Googled the top 20 attractions to see around Britain, and after ruling out ones that weren’t that interesting or too far away, Richard agreed to drive me to see Cambridge. The town of university fame was only about an hour drive away, and by late morning Richard was feeling sober enough to drive, so off we went. 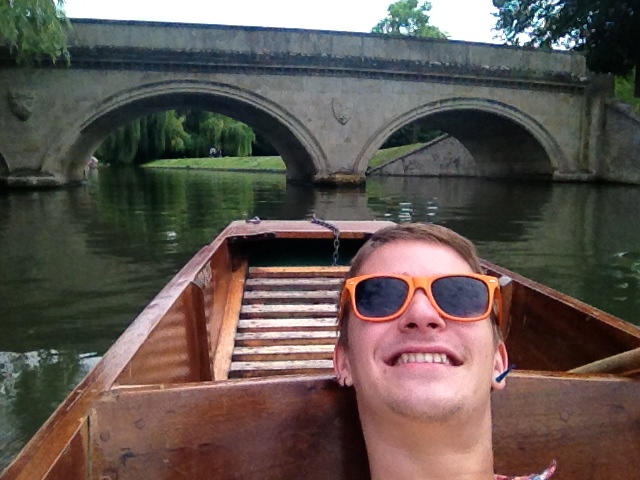 The Cam winds through Cambridge in between the various colleges. 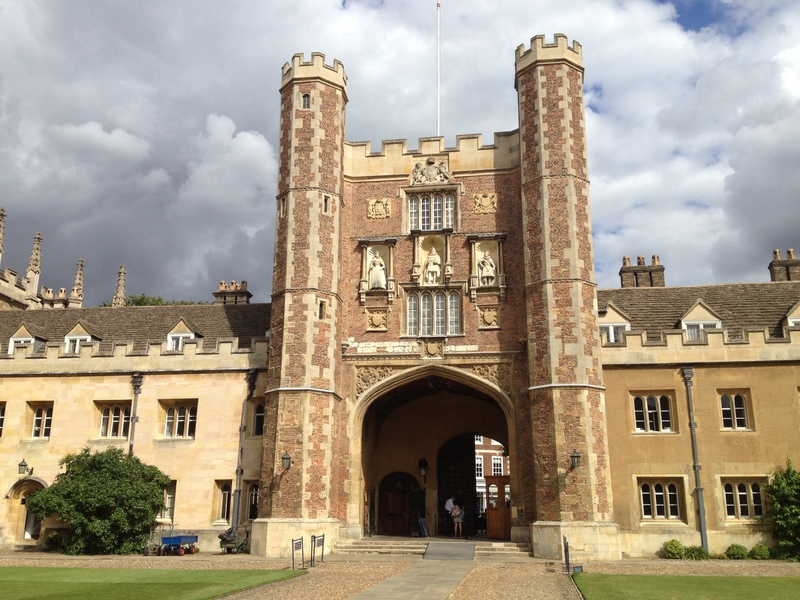 The main calling card for Cambridge is the university and colleges, so the small surrounding town is heavily focused on the student population and student life. “Where would you go out? I’d go crazy living here,” I said, only half joking. “I think they just throw a lot of their own crazy parties”, Richard said. 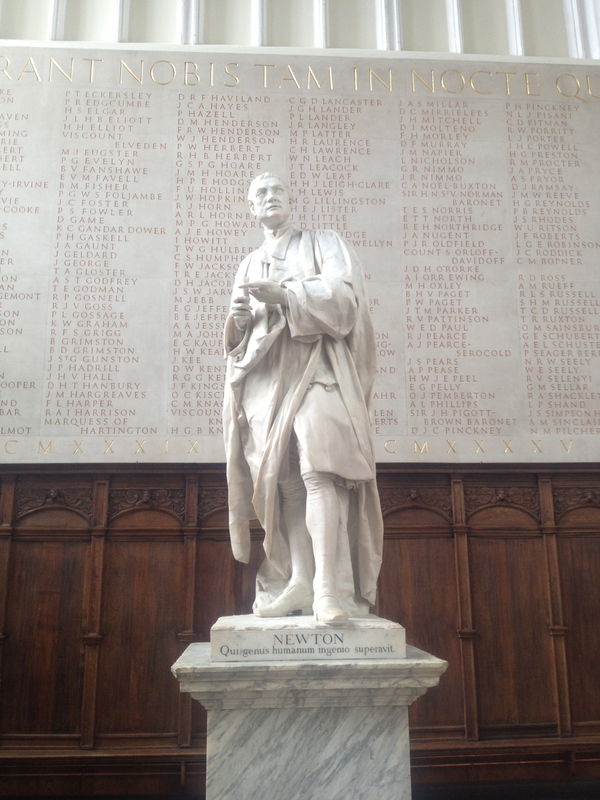 “Either that or they’re all too busy studying.” Cambridge was, I’d been led to believe, a pretty prestigious school. 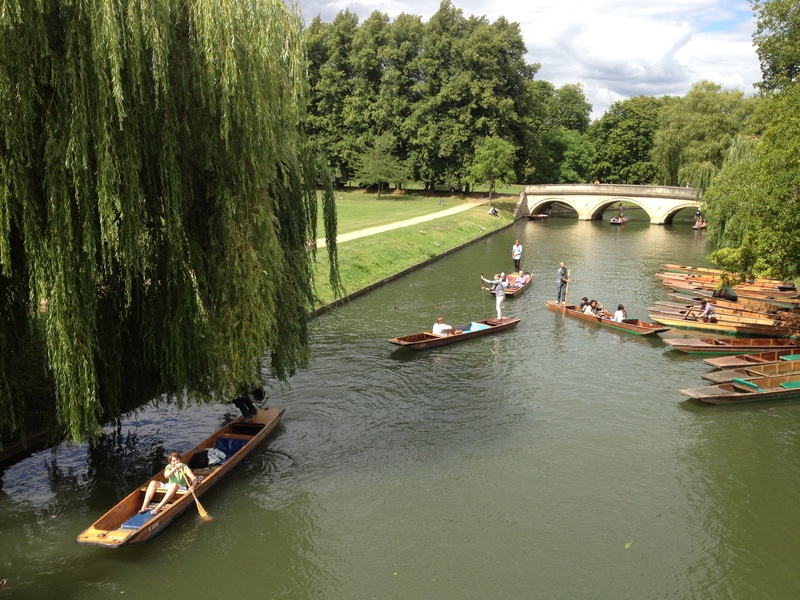 But if you’re not a student living and studying there, there are really only two things to do or see in Cambridge – the colleges and the punts on the river. 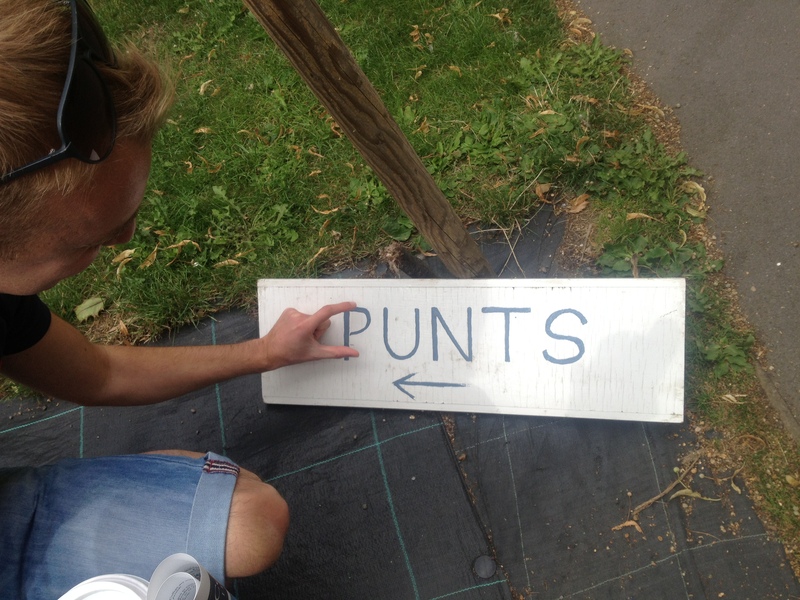 The terminology of ‘punt’ confused me at first – the word has a range of meanings depending on the culture you’re in – but I soon learnt that it was the name given to the kind of boats that travelled up and down the River Cam, the main waterway that ran through Cambridge. Richard and I followed the signs until we found the docks where the boats were waiting for us. For an extra fee you could hire someone to steer your punt for you, but despite the hangover I was feeling particularly hands on that day, and decided that we should have a go at directing the boat ourselves. Despite the potential for that to go very, very wrong, Richard agreed to it. Our punts name was Bronze. It was a shaky start, and steering the punt isn’t exactly light work. You have to stand on the flat platform on the rear end of the boat and use the long wooden pole to push against the bottom of the river to propel yourself in the right direction. Then, as the boat is gliding through the water, you have to direct the boat by moving the pole to cause resistance in the water. It might sound fairly simple – the physics behind it certainly isn’t rocket science – but after a few minutes it does become a bit of a workout, especially if you’re hungover. And it can also be a bit of a challenge to get the boat to go in exactly the right direction, or to judge how much power you need to put behind each push. Despite that, we weren’t the worst ones on the river that day. We had a couple of run-ins with a few tourist families who really shouldn’t have been driving themselves, although Richard did almost lose the pole when we went to go underneath a bridge without sinking the pole down into the water – the pole is a few metres long, and it crashed into the bottom of the bridge when we tried to go under. 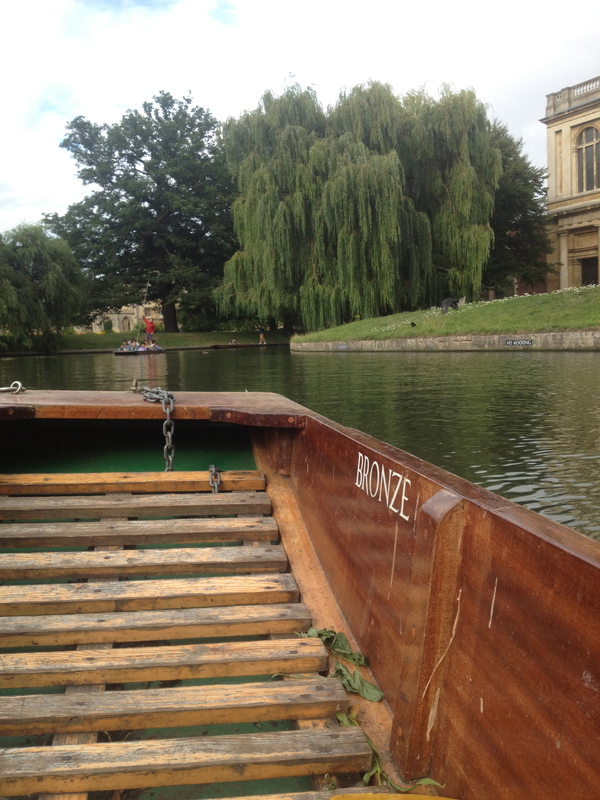 But other than that it was mostly fine, though the one really handy thing about the hired punt drivers is that they also served as tour guides, telling their passengers lots of random and interesting facts about the history of Cambridge. Richard and I were guilty of tailing some of the boats around us in an attempt to overhear some of the stories being told. 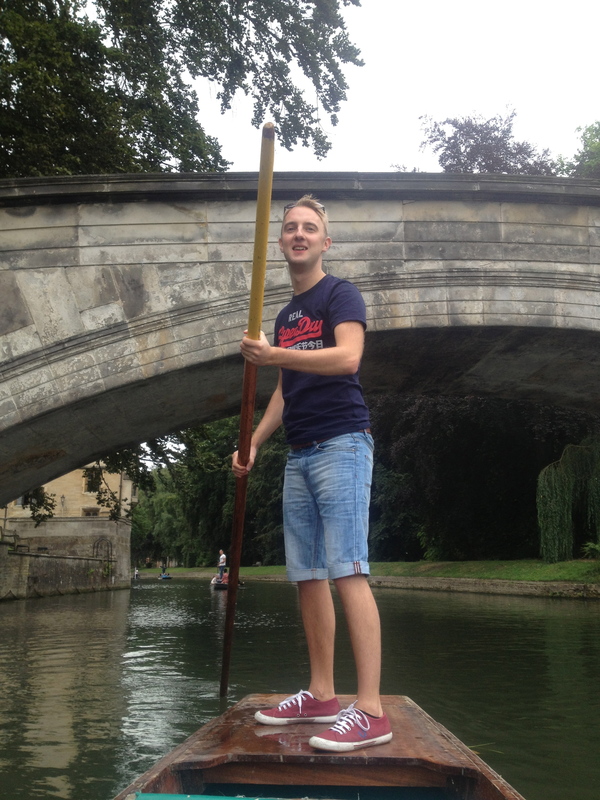 Being a passenger on the punt (right before Richard nearly lost our pole at that bridge). 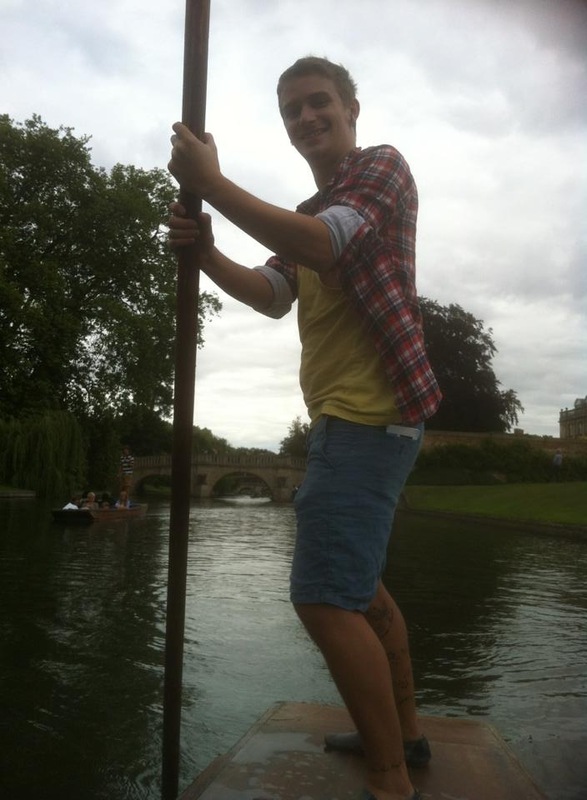 Myself having a go at steering the punt. 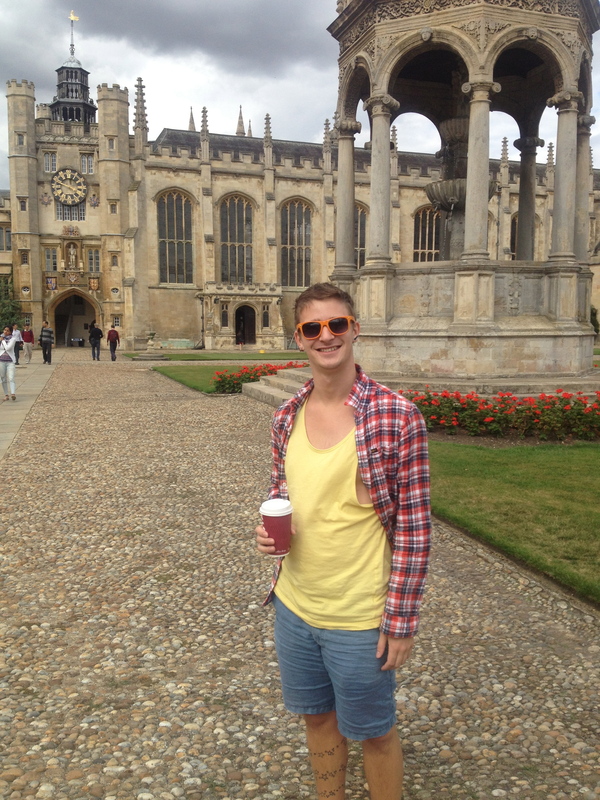 After punting we went to visit one of the colleges. 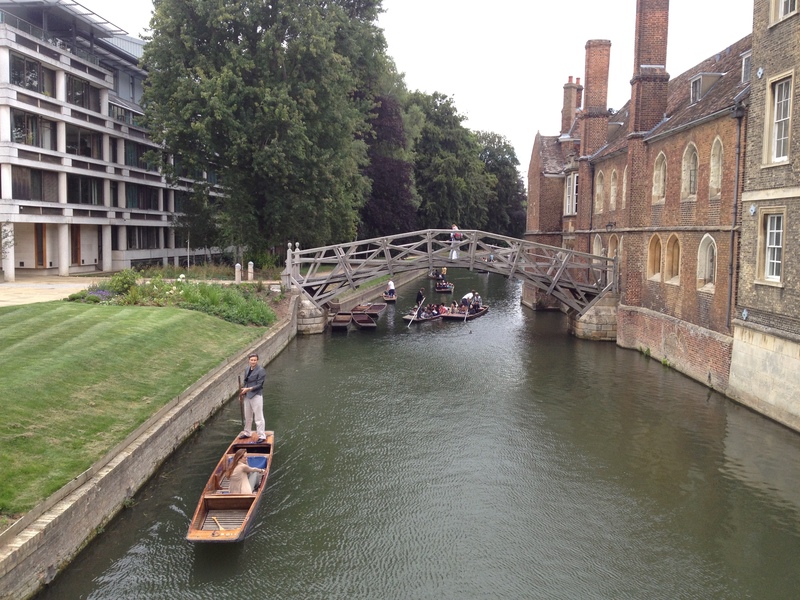 There wasn’t much point going to all of them, since we figured there couldn’t be that much difference between them – at least in the areas visitors were granted access to – but we asked one of the guys down by the punting dock which one he would recommend, and he told us to go see Trinity College. Back home, I’d often heard my own university, the University of Sydney, being described as an ‘Oxbridge’ model – a combination of Oxford and Cambridge, two of the older, more prestigious universities in England. Walking through Trinity College did remind me a lot of the Quadrangle back home in Sydney, except this place somehow felt much more authentic. We wandered through the courtyard, paid a visit to the chapel, and admired the detailed architecture. Despite the trip down the river on the punt being fun, it was somewhat of a workout (when you weren’t being a passenger, that is,) so this was probably a more suitable hungover afternoon activity. 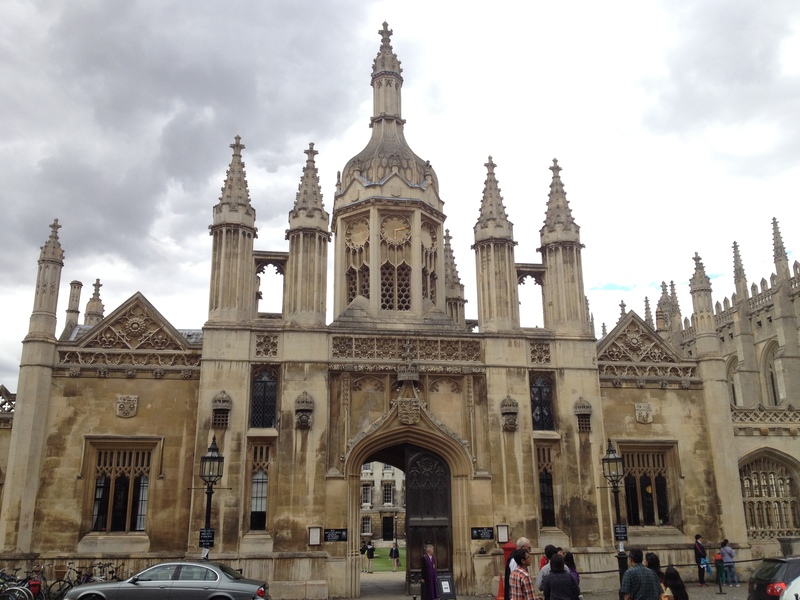 The front view of Kings College, another of the colleges we passed by on our stroll through Cambridge. Trinity College from inside the courtyard. Hungover strolls though the Trinity College courtyard. As it got later in the afternoon, we realised we’d seen most of the highlights Cambridge had to offer. We’d taken a punt down the river, we’d walked through the prestigious colleges, and wandered down the classical old English style streets. I was starting to get tired, so we decided to call it a day. Richard drove us back to London, and I definitely fell asleep for at least half of the trip. Richard dropped me home at Giles’ place, and we said goodbye knowing that we would most likely see each other again during my time in London. It had been a fun and slightly crazy 24 hours with John and Richard and their friends, but now it was time to curl up on the couch with fish and chips, British TV and definitely no wine, and wait until I finally felt human again. This entry was posted in Cambridge, England, Europe, Great Britain, London and tagged adventure, alcohol, architecture, boat, bridge, Britain, brunch, building, Cam, Cambridge, chapel, college, courtyard, crash, drink, drive, drunk, England, Europe, friends, gay, geography, Greenwich, Hackney, hangover, king, Kings College, London, lunch, Oxbridge, passenger, pole, punt, quadrangle, River, steer, student, Sydney, Thames, tourist, Travel, University, village, visit, wine, writing by Tiny Tino. Bookmark the permalink.